"From the Vermont Republican. Vermont Congressional election. By an act of the legislature, of November 2, 1818, this state is divided into six districts, each of which chooses one representative to congress. The first election under this act takes place on the first Tuesday of September next; and the time having already arrived, when the attention of our fellow-citizens must be turned to the important subject, we subjoin for the information of those of our readers who may not have access to the law in question, a compendium of its provisions. ... The Fourth Congressional District [is composed] of All of Windsor county, except the towns of Weston, Andover, Chester, Springfield, Weathersfield and Baltimore; and Braintree, Randolph, Tunbridge, Strafford, Thetford, Fairlee, West Fairlee and Vershire, in the County of Orange." The Rutland Vermont Herald (Rutland, VT). August 1, 1820. Woodstock Observer (Woodstock, VT) uses the name Aikens for Asa Aiken. The Vermont Republican and American Yeoman (Windsor, VT), October 2, reports 28 votes for Uriel C. Hatch in Fairlee. Woodstock Observer (Woodstock, VT), September 12, reports 56 votes for Horace Everett in Thetford. The Vermont Republican and American Yeoman (Windsor, VT), October 2, reports 60 votes for Elias Keyes and 1 vote for Horace Everett in Vershire. Woodstock Observer (Woodstock, VT), September 12, and The Vermont Republican and American Yeoman (Windsor, VT), September 11, report 143 votes for Elias Keyes in Barnard. The Vermont Republican and American Yeoman (Windsor, VT), September 11, reports the 2 votes for Asa Hunt as being for Asa Aiken. Woodstock Observer (Woodstock, VT), September 12, and The Vermont Republican and American Yeoman (Windsor, VT), September 11, report 28 votes for Elias Keyes and 13 votes for Horace Everett in Bridgewater. Woodstock Observer (Woodstock, VT), September 12, and The Vermont Republican and American Yeoman (Windsor, VT), September 11, report 30 votes for Elias Keyes and 13 votes for Horace Everett in Cavendish. Woodstock Observer (Woodstock, VT), September 12, reports 20 votes for Horace Everett in Hartland. Woodstock Observer (Woodstock, VT), September 12, and The Vermont Republican and American Yeoman (Windsor, VT), September 11, report 33 votes for Elias Keyes, 96 votes for Horace Everett and 20 votes for Uriel C. Hatch in Norwich. Woodstock Observer (Woodstock, VT), September 12, reports 67 votes for Elias Keyes in Plymouth. Woodstock Observer (Woodstock, VT), September 12, and The Vermont Republican and American Yeoman (Windsor, VT), September 11, report 28 votes for Elias Keyes in Sharon. 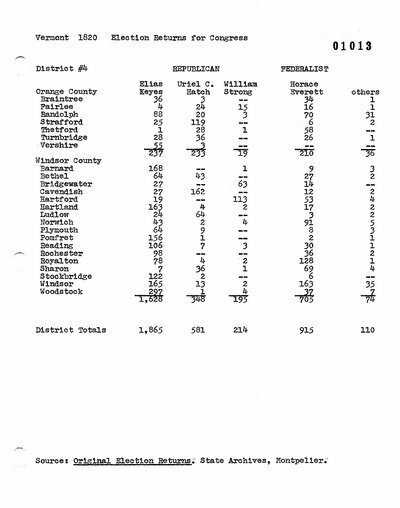 Woodstock Observer (Woodstock, VT), September 12, and The Vermont Republican and American Yeoman (Windsor, VT), September 11, report 2 votes for Horace Everett in Stockbridge. Vermont Republican and American Yeoman (Windsor, VT). September 11, 1820. Woodstock Observer (Woodstock, VT). September 12, 1820. Vermont Republican and American Yeoman (Windsor, VT). October 2, 1820.